Faced with the ceaseless stream of news about war, crime, and terrorism, one could easily think we live in the most violent age ever seen. 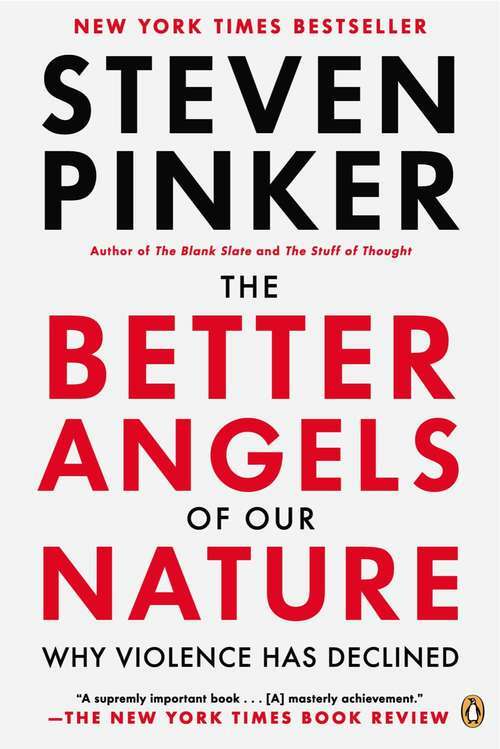 Yet as New York Times bestselling author Steven Pinker shows in this startling and engaging new work, just the opposite is true: violence has been diminishing for millennia and we may be living in the most peaceful time in our species's existence. For most of history, war, slavery, infanticide, child abuse, assassinations, pogroms, gruesome punishments, deadly quarrels, and genocide were ordinary features of life. But today, Pinker shows (with the help of more than a hundred graphs and maps) all these forms of violence have dwindled and are widely condemned. How has this happened? This groundbreaking book continues Pinker's exploration of the essence of human nature, mixing psychology and history to provide a remarkable picture of an increasingly nonviolent world. The key, he explains, is to understand our intrinsic motives- the inner demons that incline us toward violence and the better angels that steer us away-and how changing circumstances have allowed our better angels to prevail. Exploding fatalist myths about humankind's inherent violence and the curse of modernity, this ambitious and provocative book is sure to be hotly debated in living rooms and the Pentagon alike, and will challenge and change the way we think about our society. Chosen for Mark Zuckerberg's "A Year of Books"
in Mark Zuckerberg's "A Year of Books"